Whenever I read a list of all the kit a makerspace has besides having lasercutter envy, I must admit I miss seeing details of the little, almost insignifcant things that the space has to fill the gaps between the fancy machines and the code. We have “The Cupboard of Everything” as well as lots of other shelves and cabinets. We were really lucky that we had a grant to pay for the setup of our space and that included budget for equipment. We made a conscious decision to try and design for an approach that meant if someone said “do you have a…<….> so that I can make a <…..>” we would be able to supply the thing, or at least a solution for not having the actual thing. This basis has served us really, really well. Acetate film, Adhesive labels, Adhesives, Ball bearings, Batteries, Bulldog clips, Card, Felt, Felt pens, Foam core board, Googly eyes, HIPS sheets, Lolly sticks, Marbles, Modelling clay, Motors, Nuts, Paint and Paint brushes, Paper – from standard A4 to a huge roll, Paperclips, Pegs, Pencils, Perspex sheets, Ping pong balls, Pipe cleaners, Polyethylene sheet, Rare earth magnets, Rubber bands, Scrap paper, Screws, Solvents (used with care, of course), Springs, Tapes, Tulle, Utility clips, Vero board, Washers, Wheels, Wire (oh, so much wire), Zip ties. On Tuesday it allowed our Elves to help a couple of young session attendees build some battery-operated truck chassis just because they fancied learning about motors and electronics. When I came in the lab today and was told about it I have to say it left me with a big smile – it’s exactly what we want to happen. 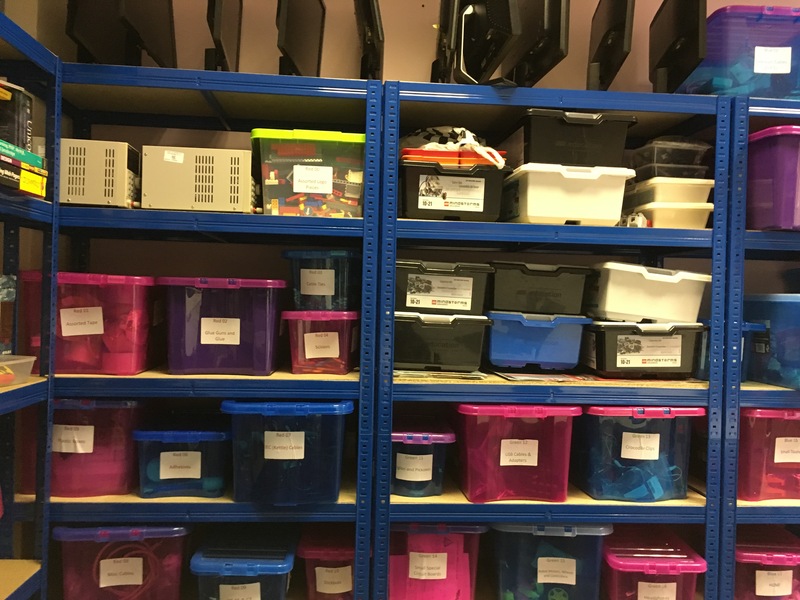 Now – it makes it difficult to keep our lab tidy but we have loads of basic metal shelving and many, many plastic storage boxes (we use Wham stackable boxes because we happened to find some very inexpensively in a local shop). We label the boxes and have a list so we can direct people to the right place. Mind you it has to be said that when someone says “Where are the HDMI cables?” the answer they’re most likely to get is “In the box labelled HDMI cables“…but you get the gist. Projects stored in their own project box with the name of the person on it. No one is allowed to nick stuff from it. Also great for making scribbling machines for a community session. Small strong magnets affixed to a steel cabinet side – can easly hold plastic bags of batteries, and other things besides. USB sticks, laminated name label, cable tie – all stored in a session box or in a drawer. Buy plastic SD card cases and write on them with a Sharpie – cost easily makes up for the ease of labelling/finding. I’d really love to learn this stuff from other makerspaces since it’s taken us years to work these things out for ourselves. I know it’s not the most eye catching topic but these are the things that save us so much time and hassle.